Late 17th-early 18th-century red morocco janséniste binding with Augsburg brocade paper endleaves, signed Jeremias Wolff (A. Haemmerle, Buntpapier, 1961, no. 471a). 134 leaves (1 column, 28 lines), bound : vellum, ill. ; 160 x 102 mm. Name of former owner (? ): PHILLIPES L[']HO[M]ME inscribed on a banner beneath the devotional figure of Christ on fol. 3; purchased by Julia Parker Wightman from Harry A. Levinson, Beverly Hills, CA, in November/December 1952; JPW 1591; given in April, 1993. Ms. book of hours, use of Meaux (Hours of the Virgin) and Paris (Calendar, Office of the Dead); written and illuminated in France, ca. 1500. Texts: in principio (fol. 7); prayer said upon rising (fol. 7v); prayer to Jesus (fol. 8); Bede's prayer on the seven last words of Christ (fol. 11); prayer of St. Augustine (fol. 12v); confession (fol. 13); various prayers (fol. 14); Obsecro te (fol. 16); Stabat mater (fol. 17); prayer to the Virgin (fol. 18); Prayer of St. Bernard (fol. 19v); prayer to the Virgin, prayer of Pope Innocent VIII (fol. 20); Prayer to the Trinity (fol. 21); prayer of St. Augustine (fol. 21v); prayer to a guardian angel (fol. 24); prayer to all angels (fol. 25); suffrage to all apostles, suffrage to all martyrs , (fol. 25v); suffrage to all holy confessors (fol. 26); suffrage to John the Evangelist, prayer to Peter and Paul (fol. 26v); suffrage to Paul Doctor (fol. 27); prayer to Philip and James, prayer to James (fol. 28); prayer to all saints (fol. 28v); prayer to Anne (fol. 29v); prayer to the Holy Spirit (fol. 31); The Passion according to John (fols. 32-38); Hours of the Virgin - Matins (fol. 39); Lauds (fol. 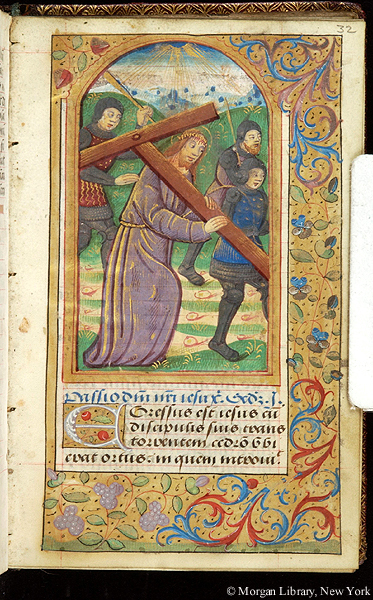 52); Matins of the Cross (fol. 59); Matins of the Holy Spirit (fol. 60); Hours of the Virgin - Prime (fol. 61); Terce (fol. 65); Sext (fol. 68); Vespers (fol. 74); Compline (fol. 78); Penitential Psalms (fol. 83); litany (fol. 89v); Office of the Dead (fol. 92); Prayer for all souls: in commemoratione animarum (fol. 111); Variations for the Hours of the Virgin (fol. 126); Hours of St. Stephen (fol. 130). Decoration: 13 large miniatures, 1 small miniature, numerous illuminated initials, illuminated borders.